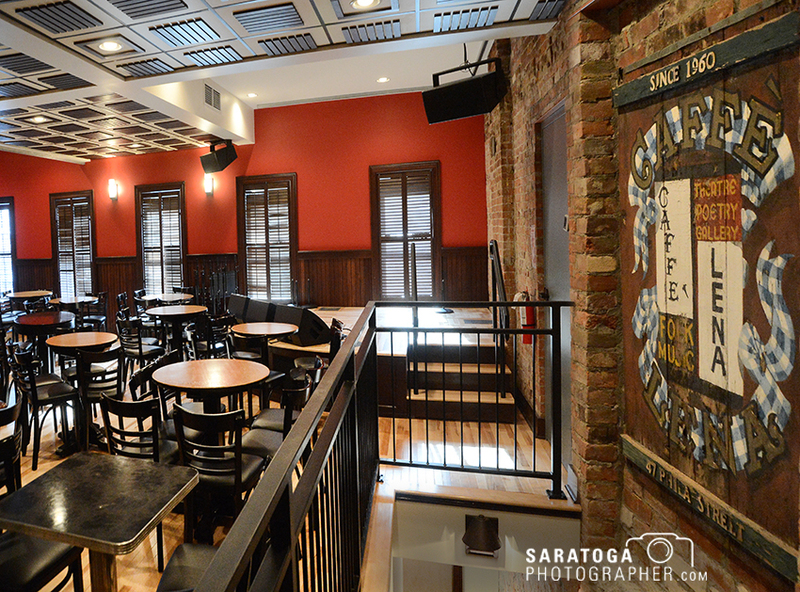 The second-floor space that is the iconic Caffè Lena, at 47 Phila St. in Saratoga Springs, underwent some major renovation and modernization and reopened on Dec. 30. A sold-out crowd celebrated the long-awaited re-opening of the legendary Caffè Lena at 47 Phila St. in Saratoga Springs on Friday, Dec. 30. The first concert in the newly renovated space featured the one-man band of Matt Lorenz, the Suitcase Junket. In honor of its re-opening, the evening ended with musical tributes to Joni Mitchell and Joan Baez. Caffè Lena holds the distinction of being the longest continuously running coffeehouse in America. They have been showcasing great folk artists for 56 years, putting on 16,000 shows since 1960, with 35,000 artists at the same iconic venue since opening there in 1960. It’s been six months since Caffè Lena closed its doors to receive a log-awaited facelift that included upgrades. A successful $2 million fundraising campaign, including a philanthropic partnership with Bonacio Construcition, made the renovation and expansion possible. The result is a more spacious concert venue with seating increased from 85 to 110; along with a new, modernized kitchen, a green room and administrative offices. 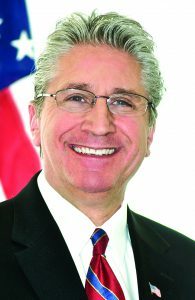 State Senator Jim Tedisco represents the 49th District that includes part of Saratoga County. New York’s aging water and sewer infrastructure, some of which dates back to the Civil War, is the lurking monster which will not go away if we just close our eyes and wish it away. On the contrary, that monster can catastrophically attack at any time the safety of our drinking water, sewer and gas lines and the ability of taxpayers to afford repairs. Support for infrastructure including our underground infrastructure that is an important part of the foundation under our roads, sidewalks and bridges is going to be one of my highest priorities this year as I join the New York State Senate as the new representative for the 49th Senate District. Vinny Frederico, left, owns Vinny’s Barber Shop at 57 Railroad Place, Saratoga Springs. For over 10 years, Vinny Frederico and his staff have been serving many loyal patrons from Saratoga County at Vinny’s Barber Shop in Malta. Spinning off of that success, Frederico opened a second Vinny’s Barber Shop location at 57 Railroad Place in Saratoga Springs last month. He said the decision was one that was a long time coming. “For a very long time I thought about opening up a downtown Saratoga location. 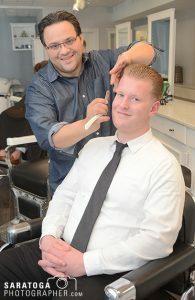 With the business district, college, and track season, that area needs a barber shop,” said Frederico. He said even though the Railroad Street location is not far from Malta, he felt bad for his Saratoga customers who had to get on the Northway and drive for a haircut. 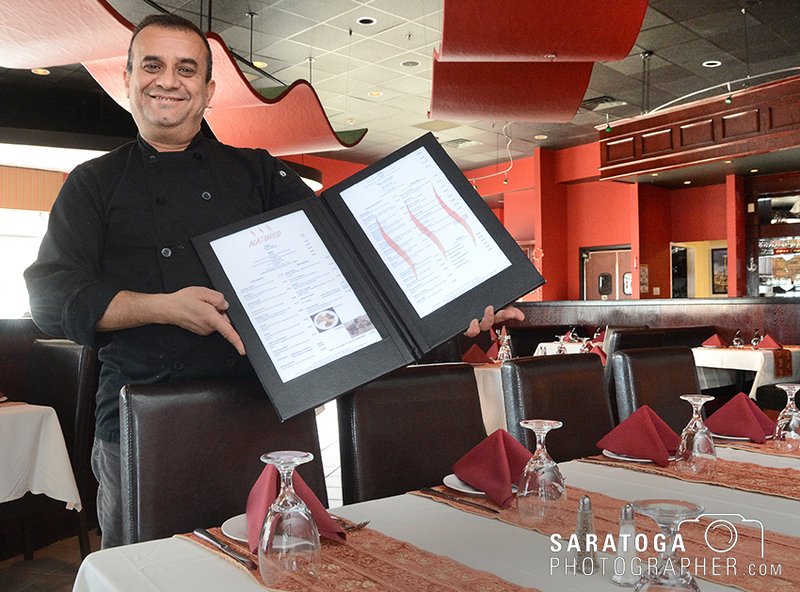 Rauf Ziya, owner of Alaturco Mediterranean Grill in Clifton Park, displays his menu of largely Turkish dishes at the establishment he opened in Clifton Park Center on Clifton Country Road. Alaturco Mediterranean Grill owner Rauf Ziya wasn’t sure how well his restaurant would do, but months after the grand opening, he happily reports that the Clifton Park restaurant is exceeding his expectations. Ziya said the Clifton Park Center location on Clifton Country Road has been a huge asset to his Turkish cuisine business. “It has been wonderful, it truly has,” said Ziya. Ziya said that the food they serve in his 2,600-square-foot restaurant is much more than just a meal. Ziya describes each dish as a craft that tells a story of Turkish heritage. The lunch and dinner selections also are all accompanied by unique Turkish wine selections, as well as domestic drink options. Saratoga Polo in Greenfield could be the site of residential and commercial development. 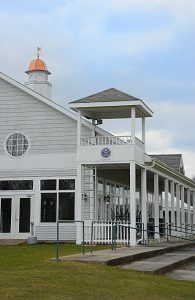 Saratoga Polo, the iconic polo venue located in Greenfield, could be the site of some major residential and commercial development, according to plans being developed by ownership. Jim Rossi, one of the owners of Saratoga Polo, is optimistic about the future of the historic Whitney playing fields and the proposed development plans for the venue located just outside the city of Saratoga Springs. Negotiations have been in the works for a deal to develop a residential and commercial site around the Saratoga Polo fields since late spring of 2016. Plans are still being finalized. In July, it was reported that Rossi and Bucci were hoping to close a deal before being put into foreclosure by First National Bank of Scotia. By October, Rossi and Bucci announced a partnership with The Michaels Group, one of the largest homebuilders in the region, and Carver Laraway, owner of the Port of Coeymans, to implement the plans to create a year-round residential and commercial property. The development would be around the polo grounds and polo matches would continue each year. “There is a process involved to get to the end result,” said Rossi. Equestricon, a first-ever international horse racing convention and industry trade show coming to Saratoga Springs in the summer, will feature more than 45 panels, discussions, events, celebrity appearances, book signings and additional programming. Equestricon, scheduled for Aug. 13-15 at Saratoga Springs City Center, is being crafted to the interests of fans at all levels of the sport. Officials announced in December an initial sampling of entertainment, discussion topics and seminars for Equestricon 2017. 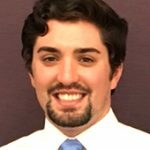 Peter Beames and Michael Himpele Jr. were promoted to credit analyst II at Ballston Spa National Bank. They will be responsible for preparing annual reviews and new loan requests for commercial borrowers. They will also support the overall analysis of commercial and other related business credit, and perform various functions associated with the management of the commercial loan portfolio. with a minor in economics from SUNY Plattsburgh. He is active in the bank’s Volunteers in Action program where he recently participated in a walk to benefit JDRF and a roadside cleanup in Malta. Himpele joined BSNB in 2015 as a credit analyst I. 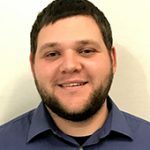 He received a bachelor’s degree in business administration from SUNY Potsdam and a master of business administration in innovation and new venture management from Clarkson University. 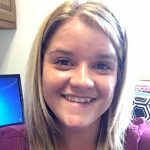 Franklin Community Center hired Stephany Deuel to the Project Lift team as a family outreach educator. Stewart’s Shops’ 2016 Holiday Match program set a record for the third consecutive season, raising over $1.85 million for local children’s organizations, the company said. From Thanksgiving Day through Christmas Day, Stewart’s customers donated over $926,000 to the program, which is an approximate $56,000 increase over last season, officials said. Each individual donation is matched penny for penny by Stewart’s Shops. There are no administrative costs and 100 percent of the funds benefit local, nonprofit children’s organizations.